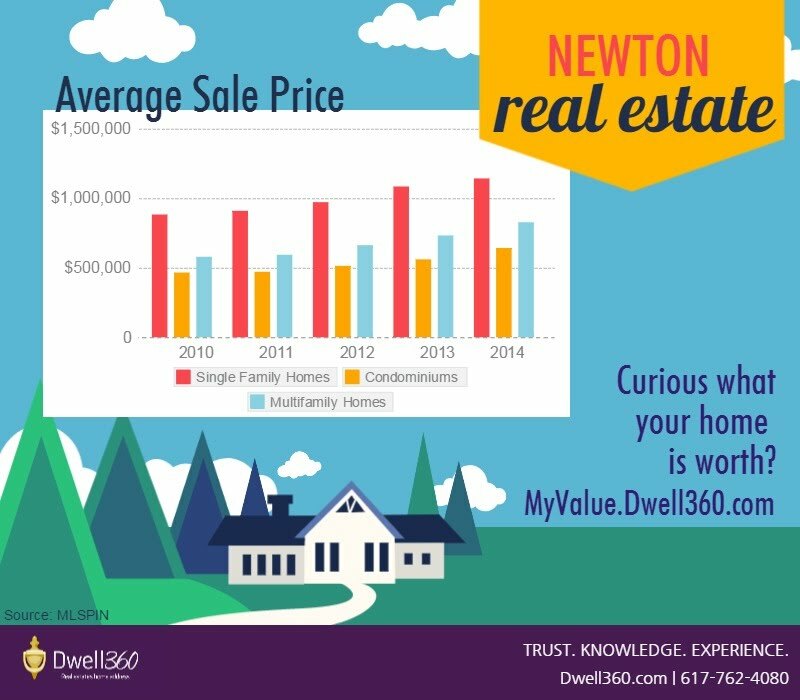 In 2014, the average price of a single family home in Newton soared over $1.1 million! Last year Newton, Massachusetts experienced another year of major gains in the residential real estate market. The number of homes sold dropped as inventory reached a low, but this further drove up real estate values. 2014 marks the fifth consecutive year of single family home price increases in the city. Enticed by the still low interest rates, buyers continued the momentum built in 2012 and 2013, and came out in force despite the lower number of homes on the market. This resulted in numerous multiple offers, quick sales, and increases in prices. Sale inventory remains extremely low, so the seller's market is continuing here in Newton. Review our full report including residential market data from 2005 through 2014. Newton’s single family homes produced the highest average sales price in history. The average price is up another 5.3%, from $1,084,518 in 2013 to $1,142,354 in 2014. While the number of homes sold decreased from 625 in 2013 to 580 in 2014, the time they spent on the market remained very short at only 52 days on average. Condominium prices are up a staggering 14.5% to an average of $641,985, the highest price ever seen. Once an affordable way into the Newton market, condos and townhouses are in short supply these days, being snapped up after spending only 41 days on the market. In 2014 multifamily homes were also in high demand, causing prices to increase by12.9% to an average of $827,208, also the highest price ever reached. The number of homes sold increased to 71, and they spent only 48 days on the market. Now is a great time to sell your multifamily home as inventory remains low in Newton. The positive changes in the market will continue to be true in 2015, but will require sophisticated navigation to ensure success. Dwell360's real estate agents use an innovative and progressive marketing approach to connect with today’s buyer. We combine a positive attitude, state-of-the-art digital marketing, and time-tested marketing tools that create an impact. Contact us to navigate through this changing time in real estate with agents both progressive and experienced in today’s market. Please contact Service@Dwell360.com for more specific information about your home's value. Market Data Source: MLSPIN, as of 1/23/2015.